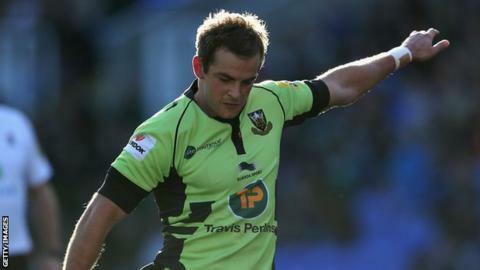 Northampton fly-half Stephen Myler has said the squad has the strength to deal with the loss of five backs. George Pisi is suspended, while Ben Foden, Jamie Elliott, James Wilson and Kahn Fotuali'i are all injured. "We may need to alter a few things but it's something we feel capable of and you have to deal with it," Myler told BBC Radio Northampton. "We feel we're in a strong position and that we've got players who can come in and are doing a good job." included a new-look Saints backline, with fly-half Glenn Dickson at full-back and 19-year-old wing Tom Collins scoring his first try for the club in only his third appearance. "We've got new personnel coming in and it's my job to make sure everything runs as smoothly as possible," added Myler, who kicked 18 points at Sixways. England full-back Foden is expected to be with a knee problem, while centre for a tip tackle during Samoa's game against Ireland earlier this month. Prop Alex Corbisiero is also sidelined for about three months with a knee injury. But Wilson, Elliott and Fotuali'i could return from minor problems in time for this weekend's Heineken Cup Pool One clash against Leinster. "We know what a quality side Leinster are. We're really excited. It's a good test for us," added Myler.